Ravens receiver Torrey Smith celebrates on the field of the Superdome following Super Bowl XLVII. The good news? Super Bowl XLVII had just about everything one could have asked for in the final professional football game for 213 days. It featured a pair of brothers facing off against each other, an icon of a generation going out on top, an energizing rookie quarterback, a jaw-dropping halftime show, an intentional safety, a 108-yard kickoff return for a touchdown and one 33-minute power outage. Not to mention a furious comeback in the second half that fell just short of making it the greatest Super Bowl ever played. The bad news? It’s the final football game for 213 days. It was a great one though. As always, we have a lot to get to in the last edition of the weekly NFL storylines being that this was the final game of the 2012-13 season. I’d just like to thank God for giving me the fingers to type this with. God is so great. Joe Flacco, Super Bowl XLVII MVP, tied the all-time record with 11 touchdown passes in a single postseason in the first Super Bowl since 2002 without either Tom Brady, Ben Roethlisberger or Peyton Manning. Only he and Joe Montana have ever accomplished that. All five quarterbacks to ever throw eight-plus touchdowns and no interceptions in the playoffs have won the Super Bowl. Ray Lewis is going out on top if you haven’t heard. After 12 seasons, Lewis won his second career title. It is the longest span between titles by any player in NFL history. Baltimore has won four straight against the 49ers, outscoring them 103-50. San Francisco lost its first Super Bowl in their history and Baltimore improved to 8-1 all-time as the No. 4 seed in the playoffs. They also improved to 2-0 all-time in Super Bowls (won Super Bowl XXXV in 2000). When they won it all in 2000, they were the No. 4 seed as well and the last two Super Bowl champions have been the No. 4 seed in their respective conferences. The previous two meetings between these two teams featured a total of two touchdowns; this one had six. Baltimore finished the regular season with a record of 10-6. In each of the last three seasons, the eventual Super Bowl champion finished the regular season with no better than 10 wins (Packers with 10 in 2010, Giants with nine last season). The NFC had won three straight Super Bowls before the Ravens win. The last AFC team to win a title before this was the Steelers in 2008. With 65 points being scored in the Super Bowl, the total from this postseason grew to 571, which broke the previous record of 530 set in 1995. No. 2 seeds had been 4-1 in their last five Super Bowl appearances before the 49ers’ loss. With Flacco winning MVP, six of the last seven Super Bowl MVP’s have been quarterbacks. Only Santonio Holmes in 2008 won the award as a non-quarterback. Baltimore became just the second team to ever win a championship after leading the league in penalty yards during the regular season (1974 Steelers). After 19.5 sacks in his first 13 games, Aldon Smith hasn’t recorded one since. In the Super Bowl, he had no sacks and made just two tackles. Six games are the longest he has ever gone without a sack. No NFL team had ever even reached the Super Bowl after ranking 15th or worse in both total defense and total offense during the regular season. The Ravens were the first and they won it all. Flacco has no interceptions in his last 195 pass attempts. With a second-quarter interception of Colin Kaepernick, Ed Reed tied the all-time record with his ninth career postseason interception. Baltimore improved to 11-5 in road or neutral playoff games in their history, the best win percentage of any NFL franchise. The 49ers had 15 former first-round picks on their roster for the Super Bowl to the Ravens’ eight, but Baltimore beat them anyway. With his first-quarter TD catch, the fourth for him this postseason, Anquan Boldin tied the amount he had in the regular season. Kaepernick was able to set the record for the most rushing yards by a quarterback in a single postseason with 264. He came up just two yards shy of tying the all-time record for rushing yards by a quarterback in the Super Bowl as he finished with 62, but did have the longest ever TD run by a quarterback in the big game with his 15-yarder. There were only four football games on TV this weekend – two on Saturday and two on Sunday. But, thats okay. It’s the playoffs! Someone really should have told Andy Dalton, though as some unfortunate quarterback play stole the spotlight on Saturday. PLAYOFFS?! Jim Mora, made famous for his rant at a press conference in 2001, is getting gained on by Cincinnati coach Marvin Lewis as the coaches the two with the most playoff losses without any wins (Mora: 0-6, Lewis: 0-4). The Bengals and Texans kicked off Wild Card Weekend for the second straight year on Saturday afternoon in a rematch of last year’s Wild Card game and the first playoff game of Matt Schaub‘s career (was injured last season). Houston won last year’s game and they won this one too, though it was ugly, 19-13. The game was the fourth rematch in the Wild Card round from the previous year in history and all four times the team that had won the first one has won the second one. In an ugly first half, the only touchdown that was scored was a Leon Hall interception return for Cincinnati, but they trailed 9-7 at the end of two thanks to some very sloppy play. The Bengals were the first team with negative passing yards in the first half of a playoff game since 2006. Dalton had -6 yards through the air in the half. It was the fourth consecutive game with a defensive TD for the Bengals and their first interception return for a touchdown in the postseason since 1973. A.J. Green had no catches or targets in the first two quarters of the game. Cincinnati has not won a playoff game since 1990 and also fell to 0-6 on the road all-time in the postseason. Dalton finished with just 127 yards on 14-of-30 passing. Both Owen Daniels and Arian Foster were huge for the Texans, who have now won a playoff game in consecutive seasons. Daniels finished the game with nine receptions for 91 yards and Foster finished with 140 yards and the team’s only touchdown as he became the first running back to ever rush for 100 yards in each of his first three career playoff games. His 425 rushing yards in those games are also good for the most by a player in his first three career postseason appearances. Shayne Graham made all four of his field goal attempts in the game. Houston still has a chance to become only the second team to win the Super Bowl after finishing the regular season 1-3 or worse. Schaub nearly doubled Dalton’s passer rating (83.4 to 44.7) as the veteran came out on top in this one. Jermaine Gresham caught just two passes for seven yards and had two drops bounce off his hands. The Texans will head to New England to take on the Patriots in a rematch of their Week 14 game on Sunday at 4:30 p.m. Houston lost the contest 42-14. 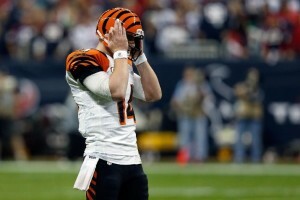 Bengals quarterback Andy Dalton struggled hearing the play calls in noisy Reliant Stadium and struggled even more in executing them as Cincinnati’s season is done. A couple hours before kickoff, Vikings quarterback Christian Ponder determined his injured elbow was not going to allow him to play in the game against the Packers. Joe Webb, who hadn’t thrown a pass this season, got the start and became the first quarterback in NFL history to start a postseason game after not attempting a pass in the regular season. He was the first QB to start a playoff game with only one career win on his resume since Kelly Holcomb in 2003. With all that going against them, it was never really close after the Packers scored 24 unanswered points to win, 24-10, and earn a rematch with the 49ers next week. Dalton may have felt a little better as Webb threw for just six yards in the first half of this game. Adrian Peterson ran for just 99 yards in the game on 22 carries and failed to become just the second 2,000-yard rusher to win a playoff game in the same season. No rushing champion has run for 100 yards in a playoff game since Edgerrin James did in 2000. This week of NFL football was one of the best ever according to pregame statistics. Six out of the 16 games featured teams with .500 records or better facing off in the third week of December. It really was fun to watch. Flight risk: The Eagles couldn’t get out of their own way Thursday night as punter Mat McBriar (1) kicked the ball into the back of his own teammate. Week 14 kicked off with the Eagles losing for the ninth time in 10 games and falling to 4-10 in an embarrassing 34-13 defeat at the hands of the Bengals in which they turned the ball over five times for the second time this year. BenJarvus Green-Ellis became a 1,000-yard rusher for the second time in his career as he opened the game with a 29-yard run for Cincinnati, who improved to 8-6 and is in position to grab the final wild card spot. The carry led to a touchdown – the Bengals’ seventh opening drive TD of the year – which is most in the NFL. They also haven’t allowed a 1st quarter touchdown in 11 games. 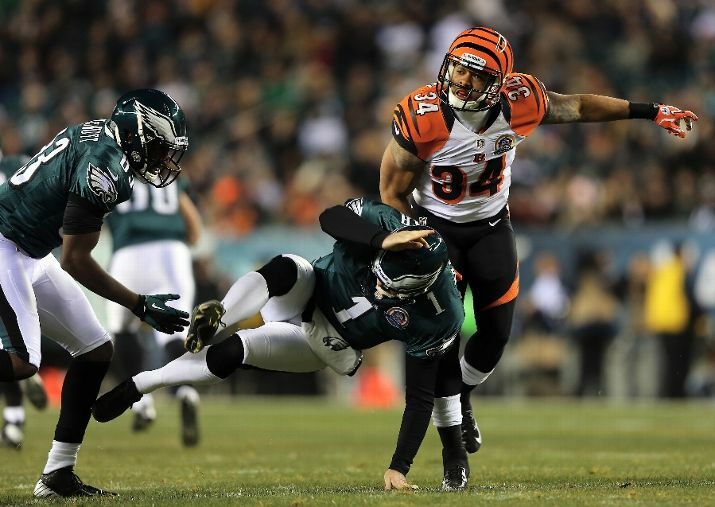 Cincy improved to 8-3-1 all time against the Eagles – the highest win percentage of any team against Philly. The last time the Eagles lost 10 games in a season was 2005. This year, they have led just once following the 1st quarter and have been outscored 82-24 in the opening frame. Cincinnati improved to 13-1 in the regular season since 2001 when leading by 10-plus points after the 1st quarter. With his 11th touchdown, A.J. Green became just the third Bengal to ever catch that many in a season. Jeremy Maclin is now the all-time leader in receptions in a player’s first four years in Eagles’ history with 246. The Eagles turned the ball over three times on four offensive plays in the 3rd quarter at a time when they were very much in the game. They also forced their first turnover in five weeks. Clay Matthews returned for the NFC North-leading Packers in their crucial tilt against the Bears and contributed six tackles, including four for a loss, as well as two sacks as Green Bay improved to 10-5 and clinched the division for the second straight year. Aaron Rodgers reached 30 TD passes for the third time in his career and became just the third QB to ever record three such seasons before the age of 30. James Jones caught all three of the touchdowns for his fourth multiple-TD game this year – the most of any player in the league. Green Bay has won 12 straight division games and also won eight of nine, while Chicago has now lost five of six. They are in danger of becoming just the second team since 1990 to miss the playoffs following a 7-1 start as they now have a record of 8-6. Fellow rookie Kirk Cousins led the Redskins against the Browns as they looked to jump into a first place tie in the NFC East with the Giants in the absence of Robert Griffin III. A 54-yard pass from Cousins to Leonard Hankerson gave Washington seven touchdown passes this season longer than 50 yards – they had six from 2007-2011 combined. Trent Richardson rushed for two more touchdowns and now is the Browns all-time leader in rushing touchdowns by a rookie with nine. He has six TD’s in his last four games. Washington has won five straight and sit at 8-6 as they ended Cleveland’s three-game winning streak and dropped them to 5-9. Rookie Alfred Morris tied the Redskins rookie record for rushing touchdowns with his eighth of the season. Cousins’ 329 yards are six more than Griffin has thrown for in any game this season. Washington now controls its own destiny in the three-way tie atop the NFC East. Matt Ryan began the game 8-8, hitting six different receivers and throwing a touchdown as his Falcons got out to a 14-0 1st quarter lead over the defending champion Giants. They would go on to win 34-0 and improve to 12-2 in the worst shutout loss by a defending Super Bowl champion ever. It was the third time that New York, who fell to 8-6, has trailed 14-0 in the 1st quarter this year. With a 12-yard touchdown catch in the 1st, Tony Gonzalez recorded at least one reception in 193 straight games, the second-longest streak ever. Julio Jones went over 1,000 yards receiving for the first time in his career and also caught his first TD at home this season, finishing with six catches for 74 yards and two touchdowns. Though they out-gained the Falcons by 64 yards in the 1st half, the Giants trailed 17-0 at the break due to a missed field goal and two failed 4th down attempts. Atlanta hasn’t lost back-to-back games since 2009. Ryan beat a defending Super Bowl champion at home for the first time in his career. The last time the Giants had been shut out was Dec. 1, 1996 – 257 games ago. The 34-point defeat was the largest for New York since a 37-point loss to the Vikings in 2009. The Falcons beat the Giants at home for the first time since 1978. 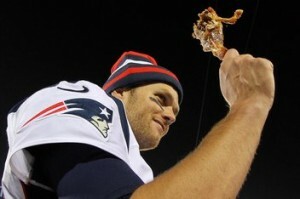 Golden drumstick: Tom Brady earned Player of the Game honors for his Thanksgiving Night performance in New England’s win over the Jets. If Thanksgiving isn’t the greatest holiday in the world, then I don’t know what is? What could be better than incredible food cooked by a mother or grandmother, family and friends and getting to watch football all day? Happy Thanksgiving. The Lions kicked off Week 12 on Thursday afternoon in their 68th straight annual Thanksgiving Day game. They hosted the AFC-leading Texans, fresh off of their 43-point performance against the Jaguars just four days earlier. It was Detroit, however, who got out to a fast start at home as Mikel Leshoure scored a rushing touchdown on their first drive. It was the first 1st quarter rushing TD for the Lions since 2010 and just their second offensive touchdown in the 1st quarter this year. It was also the first rushing touchdown the Texans had allowed all season and the first time Detroit scored an opening-drive TD all year. So they had that to be thankful for. The lead would not remain, however, and the Lions lost their ninth straight Thanksgiving Day game, 34-31, in overtime. That is good for the longest losing streak on Thanksgiving all-time. Entering the game, teams playing four days after an overtime game since 1987 were 4-13, but the Texans won anyway. Calvin Johnson became the seventh player in NFL history with 7,000 receiving yards in his first six seasons. With a Joique Bell touchdown run in the 4th quarter, the Lions now lead the league with 16 offensive 4th quarter touchdowns this season. With wins in their last two, the Texans improved to 3-7 all-time in overtime games after starting 1-7 in their short history. With 188 yards on Thursday, Andre Johnson now has 461 in his past two contests, the most in consecutive games in NFL history, according to Elias. The overtime period featured two turnovers and two missed field goals before Houston won it. The winning field goal was the first time they led all day. The Texans became the first team ever to win two overtime games in a five-day span. The other yearly participant, the Cowboys hosted the Redskins in their annual Thanksgiving Day game. Like the Lions, Dallas dropped their annual contest to the Redskins 38-31. They did, however, come back from down 35-13 in the 4th quarter to make it close. With the loss, Dallas fell to 0-14 in their history when trailing by 25 points or more at the half. It was Tony Romo‘s first career home loss in the month of November (14-1) and his first ever loss on Thanksgiving (5-1). Washington was victorious on Thanksgiving Day for the first time since 1973 and won their first ever game against their division rivals on Turkey Day. Robert Griffin III threw four touchdowns in his first career Thanksgiving Day game. On Thanksgiving Night, the Jets hosted the Patriots and were thankful when it ended as their division rivals hammered them 49-19. Julian Edelman scored two more touchdowns to bring his total to four in his past two games, which equals his total in his first 45 career games. He became the fourth player in NFL history with a receiving TD, punt return TD and fumble return TD in the same season. In the 2nd quarter, New England scored three touchdowns in 53 seconds, becoming the third team since 1970 to accomplish that, according to Elias. In their past two games, the Patriots have combined for 108 points, which is good for the third-highest two-game stretch in history. Also, the win guaranteed that the 8-3 Pats would be the only team to finish .500 or better in each of the last 12 seasons. Tom Brady threw three TD passes, extending his streak to 43 straight games with at least one. With a chance to win their sixth straight, the Bucs took on the NFC-leading Falcons at home. Despite three Connor Barth field goals and two Atlanta turnovers, Tampa fell to their NFC South rivals, 24-23. The Bucs had a chance to win six straight games for the first time since their championship season in 2002. In the loss, rookie running back Doug Martin became the first Buccaneers player with 1,000 rushing yards and 9+ rushing touchdowns since 1995. Though they are 9-1, seven of those wins for Atlanta have come by seven points or less.